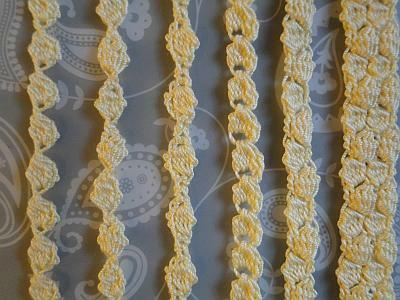 Have Fun Crocheting Braids and Cords! 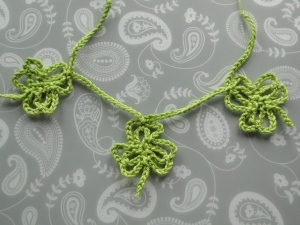 When I'm almost too tired to crochet, the one thing I like to do is grab my little hook, a ball of yarn, and just make some chain, fiddle about with it, see what happens. And what often happens is... a braid! A set of seven braids for you to work through over an evening or two. I like the simple things in life - and these fit the bill perfectly! They gave me lots of ideas for other designs, and you'll be seeing a few other lovely little items to make here on the site very soon that use some of these very basic techniques. Hmmm. The bobble. Doesn't sound so exotic, does it? Yet I find this stitch quite beautiful! The single bobble really comes into its own with a braid, as it's often the star of the show, and doesn't get lost among a whole jumble of other bobbles vying for attention! Hope you enjoy making these wonderful, stylish braids. A few chains, a few stitches, and a leaf appears! 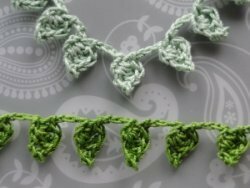 Make for an edging, decorative feature, or start and end with a length of chain to whip up a leafy necklace. An interesting piece (if I may say so!) - not the easiest, but not difficult if you follow the step-by-step photo tutorial under the written pattern. 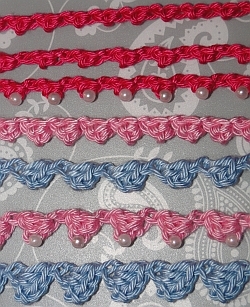 Here are two bracelet patterns on my site - but you don't have to work them up as such. 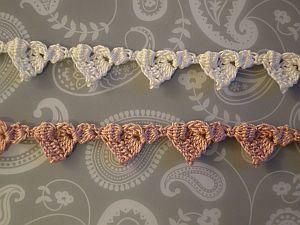 You can just follow the basic pattern and crochet the braid. With or without beads, this is such a pretty piece. Follow steps 1 - 3 to make your braid, and weave in the ends. 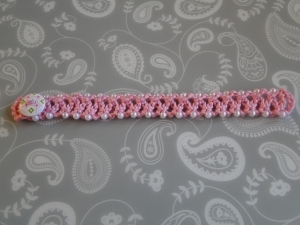 Simple stitches along a chain produced the Buttonbraid Bracelet. 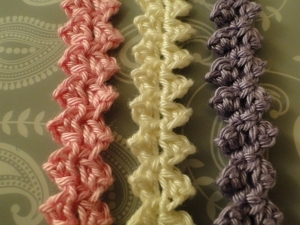 You'll find instructions for making just the braid in the pink box on that page!